Few people nowadays are aware of the brilliant and intense vegetable dyes available in England in the eighteenth century. A similar palette was used for many of the textiles, whether carpets, tapestries or needleworks. 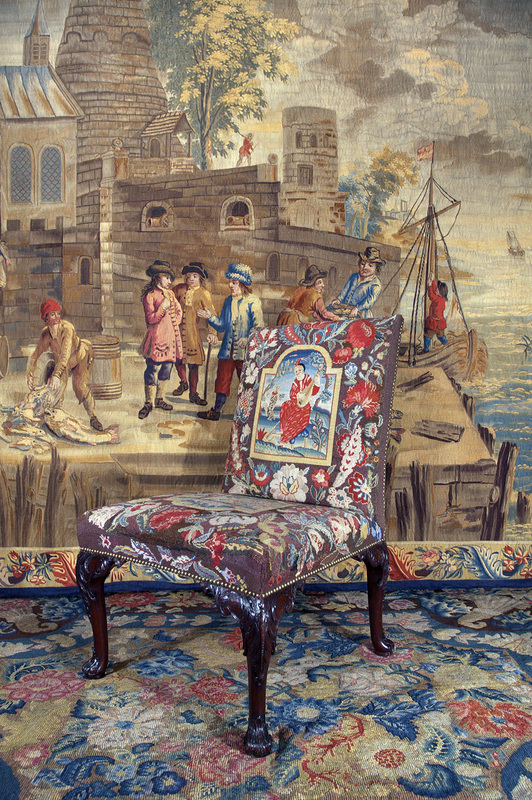 This exquisite small tapestry was woven in London in the middle years of the eighteenth century, entitled “Landing the Catch.” It is inspired by the paintings of David Teniers the Younger (1610 – 1690). The chair, attributed to Giles Grendey (English, 1693 – 1780), is one of a set of four mahogany side chairs each covered in English needlework of the same period. The George II needlework rug, embroidered in England circa 1735, displays a profusion of colourful, over-scale blooms arranged on an earthen-coloured ground.